What? Lush is the associated editor of Spectator Business magazine where she covers technology and entrepreneurs. She has also worked for BBC4, Investors Chronicle, and The World Service, and been the political and economics correspondent for Bloomberg Television. She has her own website, edielush.com, where her articles for various other publications can be read. This entry was posted in Recommended journalists and tagged #followjourn, associate editor, Edie Lush, Spectator Business, The Spectator on February 16, 2010 by Mirza Gazic. Sky News sourced live questions via its website for Saturday’s (May 16) television debate with the Guardian associate editor, Michael White, and the former independent MP for Tatton, Martin Bell. Questions were posted on the Sky News website and the feature could be watched live via video streaming or on the news channel. This entry was posted in Broadcasting, Editors' pick, Multimedia and tagged associate editor, head, independent MP, Martin Bell, Michael White, MPs expenses, Phil Wardman, Sky News, The Guardian, web users on May 18, 2009 by Judith Townend. It amused Journalism.co.uk to read on Media Monkey this morning that Telegraph associate editor Simon Heffer’s infamous ‘style notes’ are now available as a RSS feed. This entry was posted in Journalism and tagged associate editor, Billy Butlin, Journalism.co.uk, Simon Heffer on April 30, 2009 by Laura Oliver. A couple of crowd-sourced questions were taken by the Twitter panel, but some were missed. We’ll post them here and hope the panelists will answer them via Twitter or in the comments below. gemmanewby: #dna140 do you think it possible to make an entire news programme using only twitter and first person tweets as your source? Journalism.co.uk’s very own @lauraoliver was on a panel led by Wired UK’s associate editor @benhammersley at Digital News Affairs 2009. The others were Jeff Jarvis, blogger at BuzzMachine (@jeffjarvis); Robin Hamman, senior social media consultant at Headshift (@cybersoc); Darren Waters, technology editor at BBC News website (@darrenwaters); Bert Brouwers, editor-in-chief of Sp!ts (@brewbart); Katharina Borchert, editor-in-chief of Der Westen and MD of WAZ media (@lyssaslounge). This entry was posted in Events, Online Journalism and tagged associate editor, BBC News, Bert Brouwers, Darren Waters, Der Westen, Digital News Affairs 2009, dna09, dna2009, editor-in-chief, Headshift, Jeff Jarvis, Journalism.co.uk, katharina borchert, Maryland, Robin Hamman, senior social media consultant, Sp!, technology editor, traffic driver, Twitter on March 5, 2009 by Judith Townend. DNA09: Twittering – is it possible to tell the news in 140 characters or fewer? Journalism.co.uk’s very own @lauraoliver is joining a panel led by Wired.com associate editor @benhammersley at Digital News Affairs 2009. The others are Jeff Jarvis, blogger at BuzzMachine (@jeffjarvis); Robin Hamman, senior social media consultant at Headshift (@cybersoc); Darren Waters, technology editor at BBC News website (@darrenwaters); Bert Brouwers, editor-in-chief of Sp!ts (@brewbart); Katharina Borchert, editor-in-chief of Der Westen and MD of WAZ media (@lyssaslounge). This entry was posted in Events, Online Journalism and tagged associate editor, BBC News, Bert Brouwers, Brussels, Darren Waters, Der Westen, Digital News Affairs 2009, dna09, dna140, dna2009, editor-in-chief, Headshift, Jeff Jarvis, Journalism.co.uk, Justin.tv, katharina borchert, Maryland, Robin Hamman, senior social media consultant, Sp!, technology editor, Twitter on March 5, 2009 by Judith Townend. A look at how mainstream media (MSM) is seizing upon, or resisting technological changes. Guido Baumhauer, director of marketing, sales and distribution at Deutshe Welle. Are ‘publishers’ and broadcasters ending up in the same space? It’s not really a relevant distinction, the BBC’s Loughrey tells Journalism.co.uk after the discussion. “I do not see myself as part of the established media,” Hans Laroes is keen to point out at the beginning. The broadcast enterprise is still quite a separate one from the web at Sky, says Bucks – although web users already have some influence on television content, and maybe, the future could see online increasingly dictating television content. What on earth is ‘database journalism’? Neil McIntosh said that while ‘it has to be said it’s being used for extremely boring journalism,’ it’s about pulling together raw material in exciting ways, such as in crime mapping. There is lots of potential for the Wall Street Journal, he added. How do we manage editorial, strategy and sales relationships? Following on from his keynote speech, Vandermeersch stresses that editorial, sales and strategy will have to work closer together. However, how far that goes is up for debate he says: for example, do you drop stories which are less good commercially? Meanwhile, at Deutsche Welle, marketing team, editorial and media sales representatives are meeting in small ‘competence teams’ in order to address monetising and editorial issues in different countries (they have 4,500 media partners worldwide), explains Baumhauer. This entry was posted in Events, Online Journalism and tagged associate editor, BBC, Ben Hammersley, De Standaard, Digital News Affairs 2009, director of marketing, dna09, dna2009, editor, editor of the Belgian newspaper, European editor, Guido Baumhauer, Hans Laroes, head, head of news, Journalism.co.uk, mainstream media, mainstream media reacting, media sales representatives, Neil McIntosh, Pat Loughrey, peter vandermeersch, Simon Bucks, Sky News Online, The Wall Street Journal, Wall Street Journal, web users on March 4, 2009 by Judith Townend. After 124 years in publication, industry news organisation Editor&Publisher (E&P) has entered the blogosphere with two new titles. Fitz & Jen Give You the Business, written by editor-at-large Mark Fitzgerald and associate editor Jennifer Saba; and The E&P Pub, which will take contributions from all staff, went fully live today. Because E&P’s main site doesn’t allow article comments, selected articles will be republished on the blog, an announcement by E&P said. This entry was posted in Journalism, Social media and blogging and tagged associate editor, blogs, E&P Pub, editor, Editor&Publisher, Jen Give, Jennifer Saba, launch, Mark Fitzgerald, The E&P Pub on September 3, 2008 by Laura Oliver. IPC Southbank is launching a website for bridal magazine Wedding. 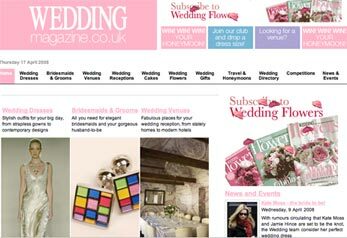 Weddingmagazine.co.uk will feature a directory of wedding businesses, which visitors can search by region and type. In addition the new site will feature picture galleries, information and polls on wedding accessories, venues and honeymoon destinations. The site also plans to launch a forum area once established. The launch is being promoted throughout IPC Media’s raft fashion and beauty magazines and websites. Wedding’s associate editor Kate Smallwood, a former content editor for confetti.co.uk, will act as website editor. This entry was posted in Magazines and tagged associate editor, bridal magazine, confetti.co.uk, content editor, editor, IPC Media, IPC Southbank, Kate Smallwood, launch, website editor, Wedding, Weddingmagazine.co.uk on April 17, 2008 by Oliver Luft.